It did end up raining last night around 11pm, but it was just a shower. It sounded wonderful, but the trees were enough to catch it as hardly anything hit the tent and I was able to keep my doors open with just the mesh exposed with not problem. I didn’t sleep well because there were deer walking around in the leaves down the hill from my tent on and off all night. It had to be deer the way they were moving, but it was so silent outside that it sounded like something much bigger. Also, it was the first night that I’d say it was hot and humid. I wore as little as I could and was sticking to my sleeping pad and couldn’t decide if I wanted the comfort of the sleeping bag or not. I got up and was hiking by 6:45am. It was a leisurely hike today as I only needed to do 10mi to get to where I was going to be picked up to go to town. 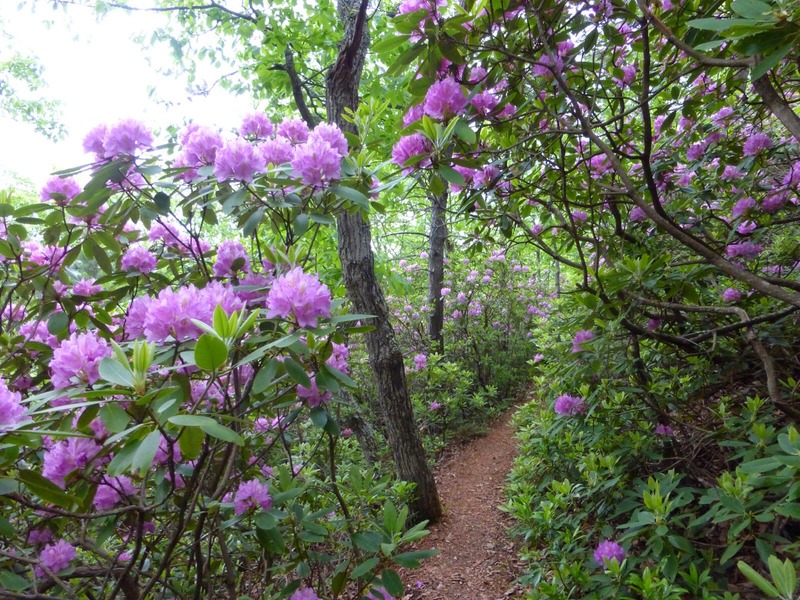 The rhododendrons are in full bloom and it’s really magical to walk through them and also have their petals covering the trail below. 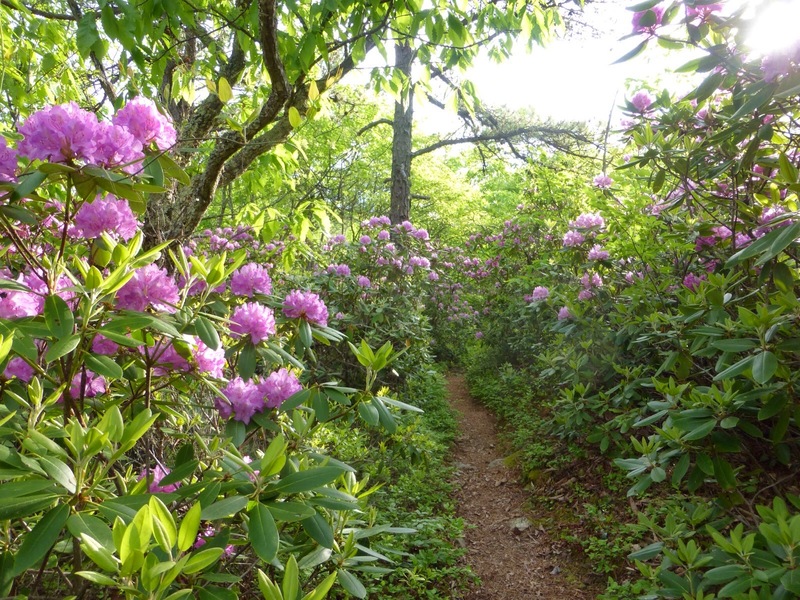 For most of the morning, the trail paralleled and crossed Blue Ridge Parkway. 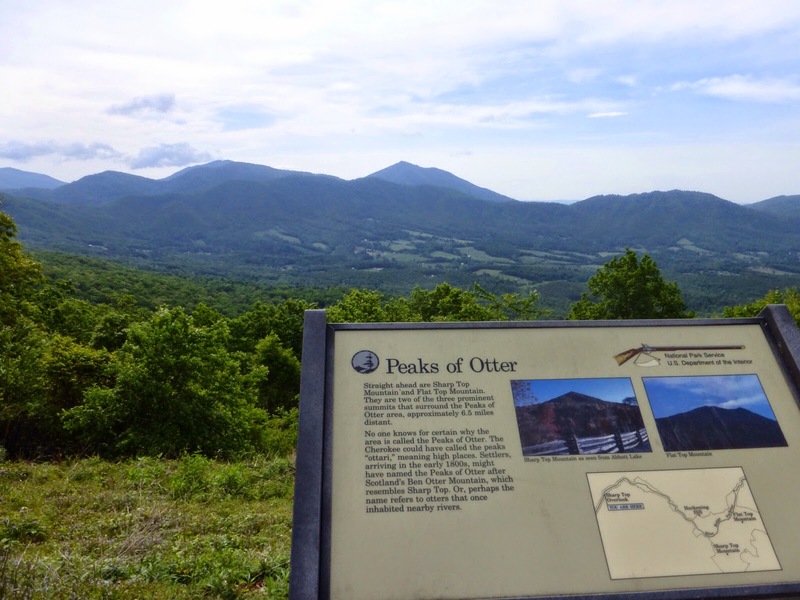 A scenic drive with many pullouts for cars to see overlooks or viewpoints. It looked like this as the trail wove back an forth from one side to the other of the road. Each time the trail crossed the road, it would dip back into the forest for a mile or so before coming out to the next pullout. 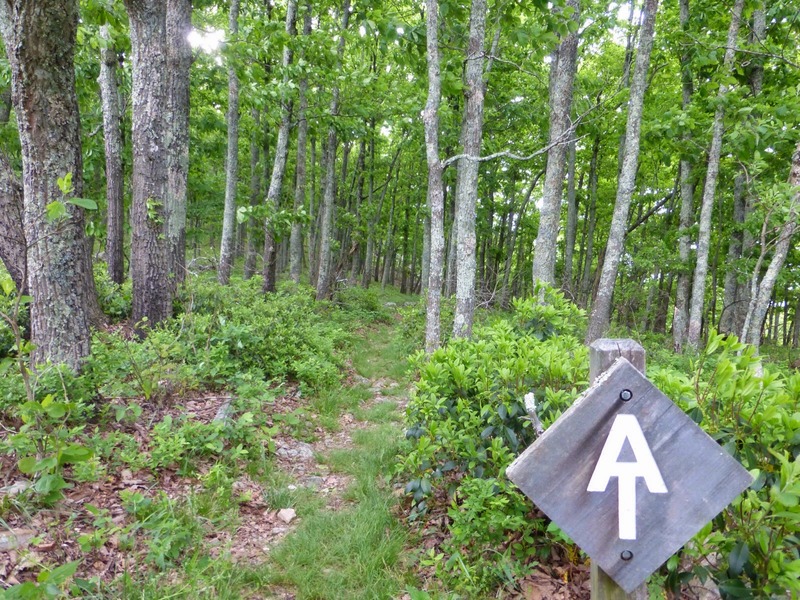 It was very well maintained and had nice formal blazes indicating the AT. I mentioned that I caught up on phone calls yesterday. One call was with my mom and she was looking at a map I had given her of the trail. She saw a cute name on it that said, “Peaks of Otter” and was hoping I’d pass near it. I couldn’t resist getting a picture of it when I got to this at one of the pullouts. It shows two of the most prominent mountains in that area. It was about 10:30am when I got to the road where Coach K was waiting to shuttle me to Daleville. He is a triple crowner I’ve known since I met him on Day 85 of my PCT hike. Of course, havign thru hiked himself, Coach K knew I’d be hungry and he had Burger King breakfast and Gatorade for me! He drove me back to Daleville where Ferris was taking a zero and I am splitting a room with Ferris. He is feeling lots better and has eaten a ton. A well needed zero for him. 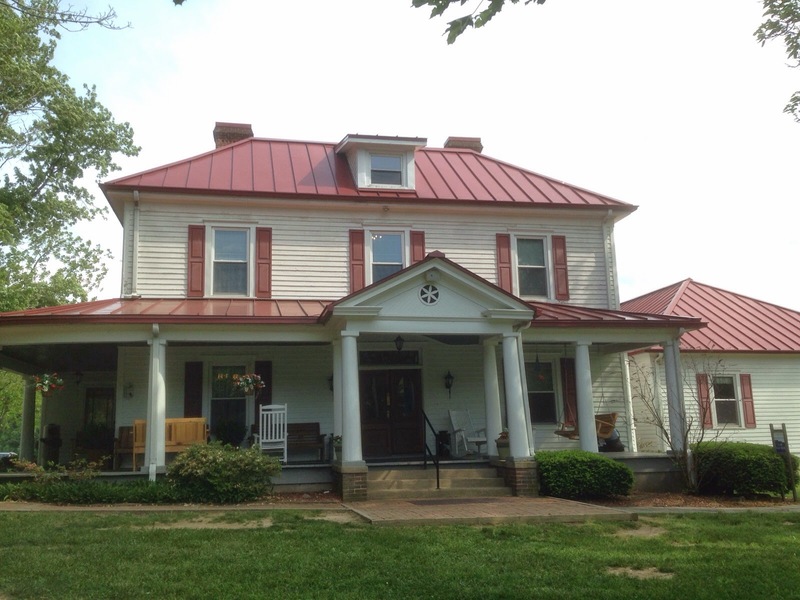 I did my town chores and Coach K took us to resupply and then on to the Homeplace for dinner. It is a restaurant we passed a few days ago that was closed, but is said to be a “must do” along the trail. It was a large house with gazebos around it. 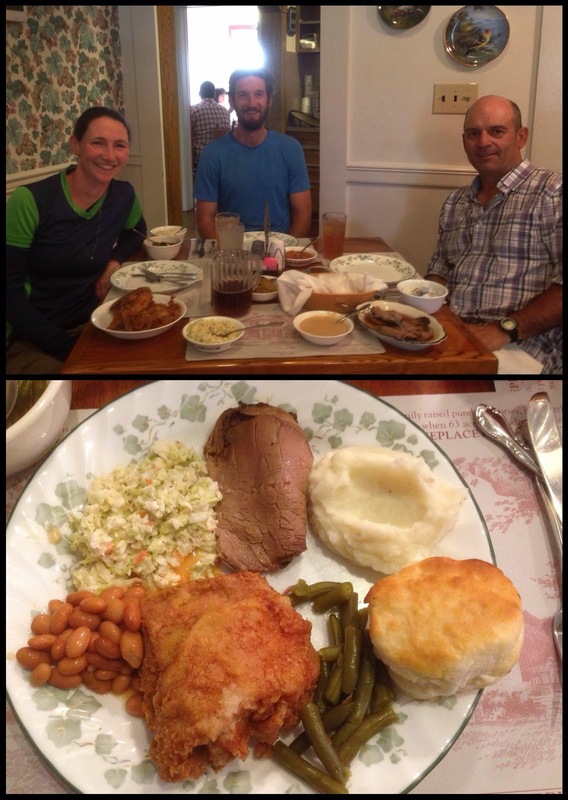 At the Homeplace, it’s an all you can eat family style dining. They bring small bowls of sides and meats and just keep brining more of whatever your table clears. You can choose among four meats…fried chicken is automatic and then there is ham, roast beef, and pulled pork. We chose to do chicken and roast beef. We all really enjoyed it and I felt like it was a family holiday dinner with so many things to eat. It’s now a couple hours later and I still don’t know if I can eat anything else! 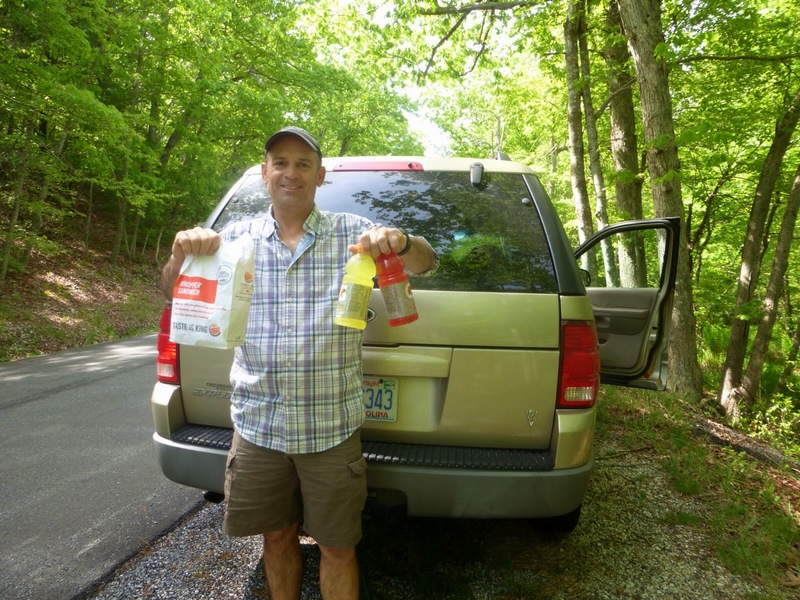 Whew, it is a fun thing to do as a thru hiker, I’ll say that! I do want to thank my friend John who funded this meal for me and requested a good food photo, so here ya go!My favorties were the roast beef, coleslaw, and potatoes with gravy. Thank you! So it was a great nero and I am wiped out. I’m sure I’ll sleep great tonight. Thanks to Coach K for making all this happen! You rock! Tomorrow, I am going to have a relaxed morning and leave at checkout. I needed to find a shuttle back to trail and when I looked in the AT Guide, the name Homer was in the book…yep, the same Homer I took a picture of yesterday doing trail maintenance! His wife is going to shuttle me back to trail as they do that for a fee and it will be great to meet her tomorrow.